Late May to mid-June generally isn’t a great time for pretty garden pictures here at Hayefield. I’m usually just getting around to setting out the annuals and tender perennials, so the new plants are pretty puny. And, I normally end up cutting most of the summer- and fall-blooming perennials back hard (anywhere from halfway to all the way to the ground) the last week of May, so anything that is pretty in flower now is likely to be surrounded by chopped stems. Still, interesting combinations have a way of happening despite all this. 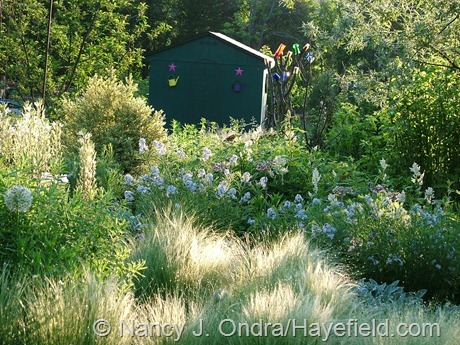 In an effort to remind myself of that – though all I can see right now is the mud, the mess, and the weeds – I thought I’d take a look back through my archives to collect some of my favorite late-spring and early-summer images.